The Croydon Tennis Centre Challenge event is open to all players with the ability to serve and rally. 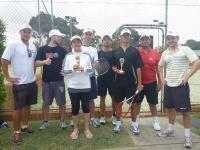 A singles and doubles event with a round robin format finished off with a BBQ and a few laughs. The challenge is hosted by one of our experienced coaches. BYO food for the tournament breaks (meat, salad, dessert...). BBQ facilities are available ! !